"Sunrise crashes an aurora party over the southern hemisphere," said NASA astronaut Ricky Arnold of this image he snapped from the International Space Station. On the International Space Station (ISS), you can only admire an aurora until the sun rises. Then the background Earth becomes too bright. Unfortunately, after sunset, the rapid orbit of the ISS around the Earth means that sunrise is usually less than 47 minutes away. In this image, a green aurora is visible below the ISS—and on the horizon to the upper right, while sunrise approaches ominously from the upper left. Watching an aurora from space can be mesmerizing as its changing shape has been compared to a giant green amoeba. Auroras are composed of energetic electrons and protons from the Sun that impact the Earth's magnetic field and then spiral down toward the Earth so fast that they cause atmospheric atoms and molecules to glow. 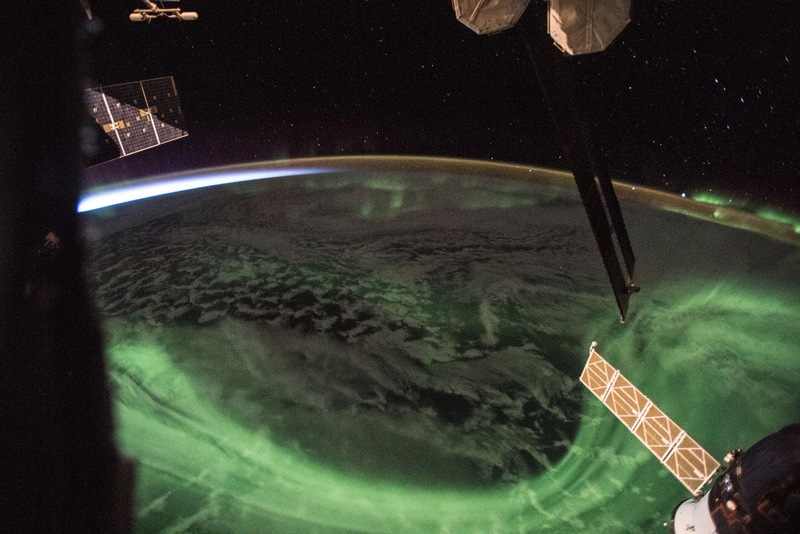 The ISS orbits at nearly the same height as auroras, many times flying right through an aurora's thin upper layers, an event that neither harms astronauts nor changes the shape of the aurora.